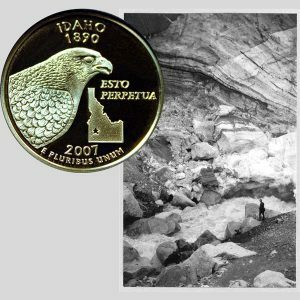 Today, the Idaho State Quarter Coin remembers the report of August 15, 1892 of a newly discovered glacial field in the relatively new state. Immense Glacial Field Discovered in Central Idaho. Boise (Idaho) Aug. 15 . —An immense glacial field has been discovered in an unexplored region of Central Idaho, by F. B. Schermerhorn, geologist and mineralogist, who is working in the interest of Idaho’s exhibit at the World’s Fair. “As I came over the divide into Big Creek I saw away to the west, among the high mountains, what appeared to be a glacier. “Inquiry at Big Creek developed the fact that though two of the men in camp had lived there several years, they had never been able to get up to that snow. “They also told me many had tried it and failed. “All had tried to take horses with them. I determined to go on foot. “As I advanced the signs of white men decreased, until they disappeared altogether. “The country through which I made my way was the wildest and roughest of any through which I have ever traveled. “In point of grandeur and picturesqueness the view from the peaks rivals anything in mountain scenery in the United States. “Beneath the glacier field I found a series of glacial lakes. “The glacial fields are quite extensive. “They probably cover nearly as great an area, though not so thick, as the great glacial fields of the Alps. “I examined sixteen terminal moraines. Of this number eleven were receding, four stationary and only one advancing. The writer says that the glaciers are located about thirty-five miles south west of Shoup, amid a number of very high peaks that are not down on the maps. The Idaho State Quarter Coin shows with an image of a glacier and glacial stream, circa 1900.